If you are the history-making mystery cyclist and you took a selfie, please send us a copy! – or tell us who you are anyway. The photo here was taken soon afterwards by Spokes member @UncleKempez. For the history of the Meadows counter see our April 2014 story, shortly after it was installed. 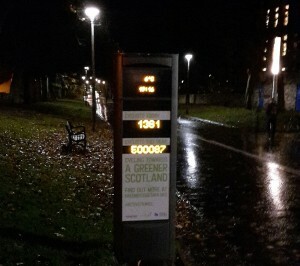 It was one of 10 installed by Sustrans Scotland with Climate Challenge funding. And there’s more about it on page 3 of Spokes 119. There’s a live feed of the data from Scotland’s 10 counters (and Wales’s one!) here. Public counters are a fun promotional tool as much as anything else – there are other more widespread counting methods and counters not visible to the public, some of which we describe on our traffic counts page. 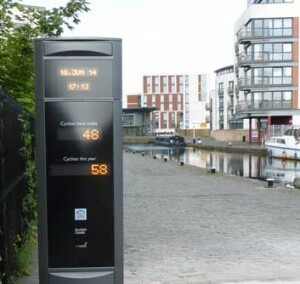 But nonetheless the massive public visibility of the counters – inc luding the master counter outside the government’s Victoria Quay offices – are a great addition to the public and political visibility and understanding of the role of cycling as a means of transport. We do, however, have two gripes about Edinburgh’s counters. First, the poor location of the Canal counter – missing the many cyclists who cross the lift bridge to use the quiet tarmac street opposite instead of the badly cobbled towpath on which it sits. Second, with the Meadows counter, the fact that Greener Scotland, the government’s ‘green agency,’ plastered their massive (and somewhat visually intrusive) poster over the Spokes logo which recognised our 3-year effort to get a Middle Meadow Walk counter installed.